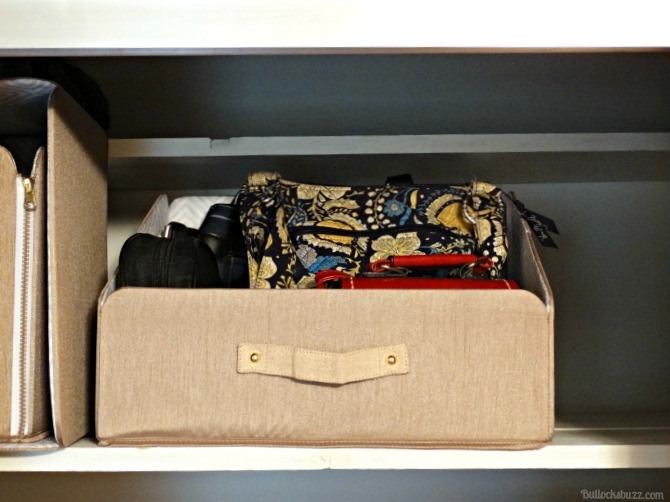 Six Tips for Organizing Closets & SOFI: Say Goodbye to Chaotic Closets! Moving is a colossal pain in the rear, but at the same time, it gives you the chance to do some major cleaning and organizing.  This year, our move coincided with Spring Cleaning, so not only was I able to get rid of a lot of junk we no longer needed, I was also able to unpack and organize starting from a clean slate. Despite this, within the first few weeks, the closets were not very organized. 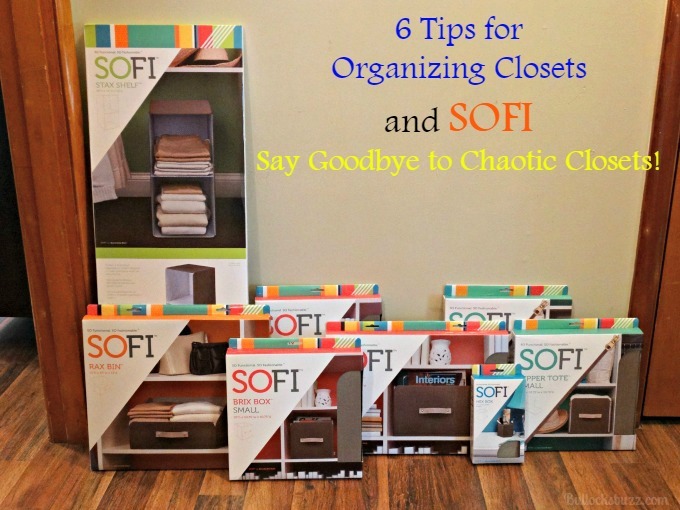 But now, along with some help from SOFI and these six tips for organizing closets, closet chaos is a thing of the past! The new SOFI™ line offers a smart, sophisticated and stylish organizational system that allows you to customize your organization and is designed to make spaces work the way you want. The collection includes a variety of boxes, bins and totes featuring simple and soft geometric forms with rounded corners that are covered inside and out in a stain-guard protected silken material. Strong, woven handles are reinforced with fashionable brass rivets, and gold fasteners and zipper accents add a sense of fun and function. To add a sense of sophistication, SOFI products come in a pretty mocha color on the exterior, which is complemented by an interior in a lovely lavender-grey geometric print pattern. Best of all, all SOFI™ Boxes, Bins and Totes are made from a minimum of 65% recycled content. The SOFI collection includes several styles of containers, each of which work perfectly for an entire closet remake, or used individually to add some organization and style to those individual spaces in your home that need a bit of order. The versatile Brix Box™ is easily accessible with pull-out handles and open tops. It comes in two sizes – small (10″h x 10.75″w x 10.75″d) and large (13″h x 10.75″w x 10.75″d) – and can be used to hold a variety of things. The Brix Bin™ is just like the Brix Box™ except it is a bit wider and longer, measuring 10″ in height, 15.50″ in width, and 10.75″ in diameter. The Zipper Tote™ is also similar to the Brix Box except that it features zippers on each side of the front panel so you can unzip it for quick access to clothes and accessories. The Zipper Tote is available in both small and large sizes. The Stax Shelf™ makes the most of your vertical space and maximizes storage by forming shelves that you can either use as is, or slide a Brix Box or Zippered Tote into. Each Stax Shelf measures around 24″ in height, 12″ in width, and 12″ in diameter, and can hold up to 15 pounds per shelf. The angled sides on the Rax Bin™ are ideal for at-a-glance access to purses, hats and footwear. Each Rax Bin measures around 10″ in height, 15″ in width, and 13″ in diameter. They fit nicely on a shelf or on the floor. 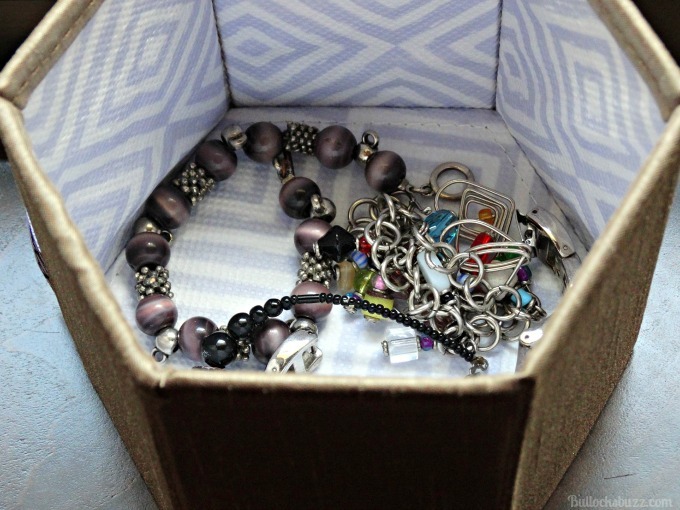 Hex Boxes™ are small, hexagonal shaped bins perfect for placing in your drawers or on your nightstand and dressers in order to store jewelry, socks, and other small trinkets that can be easily lost. Each one measures around 4″ in height, 5″ in width, and 4.25″ in diameter, and come two per pack. 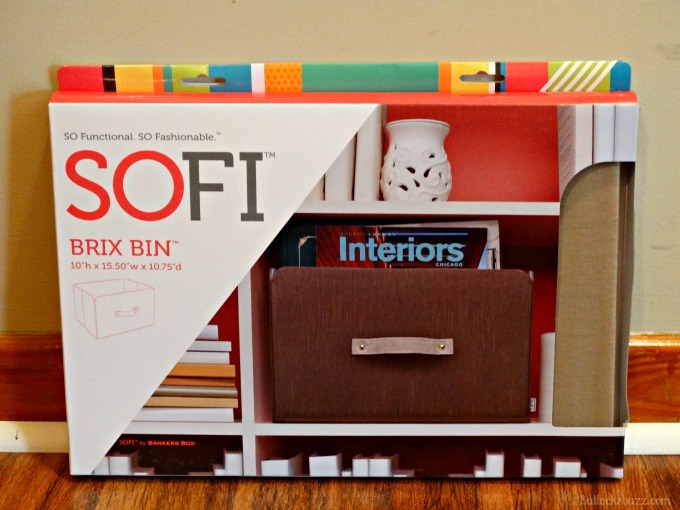 Each SOFI box, bin and tote has sturdy sides and bottoms, and is completely collapsible for easy storage. To assemble, you simply unfold, insert the bottom piece, and they are ready to use. The first area to tackle was the closet in the master bedroom. 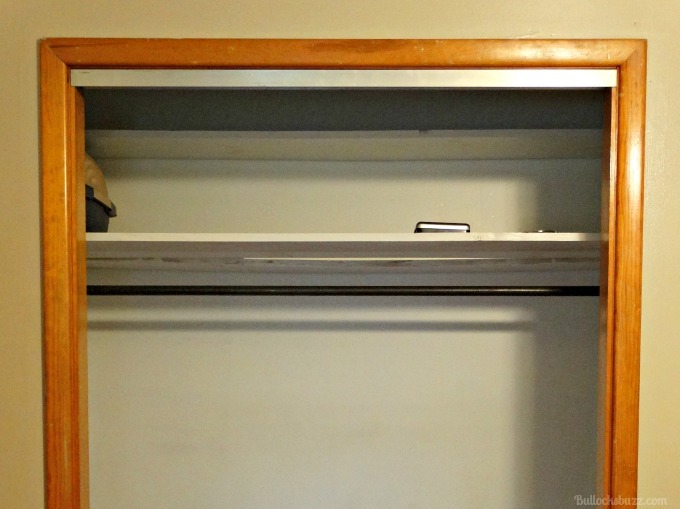 Before, our closet consisted of a single bar for hanging clothes and two top shelves – the very top one sits further back so is pretty much useless. There was nowhere to neatly place sweaters, belts, hats and other items that are not ideal for hanging, and no way to put things on the shelves without it looking messy and leaving a lot of unused space. Using the Stax Shelf, a small Brix Box, a small Zipper Tote, and a Rax Bin I was able to use up a lot of that wasted vertical space formed by the single shelf, while still keeping the closet neat and organized. 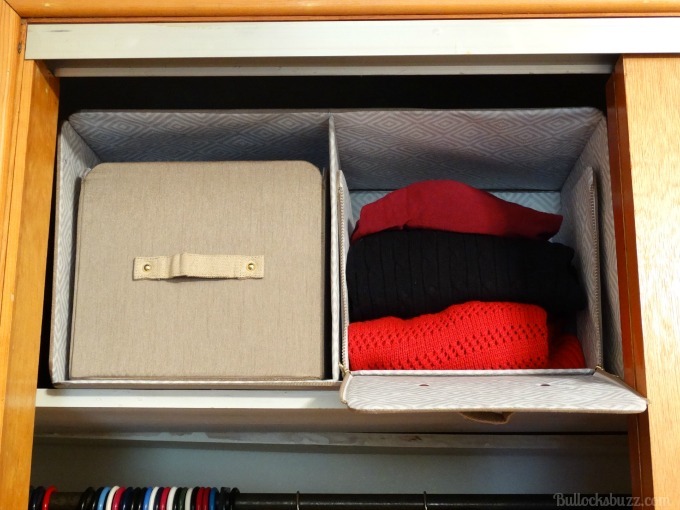 The Brix Box holds our belts, scarves, hats and gloves, while the Zipper Tote hold my sweaters. I love that I can simply unzip the front panel on the Zipper Tote to pick out the sweater I want to wear. As a bonus, both the small Zipper Tote and the small Brix Box fit perfectly inside the Stax Shelf allowing me to conserve even more space. The Brix Bin sits perfectly beside the Stax Shelf and now holds all of my purses. They actually fit perfectly side by side, and take up much less room than when I had them sitting on the shelf. Plus, a simple glance, and I can grab the exact one I want to use. The Hex Boxes worked out perfectly, too. The one on my husband’s nightstand holds his keys, pocket knife and other small items, while I use mine for my bracelets and watch that will not fit in my jewelry box. 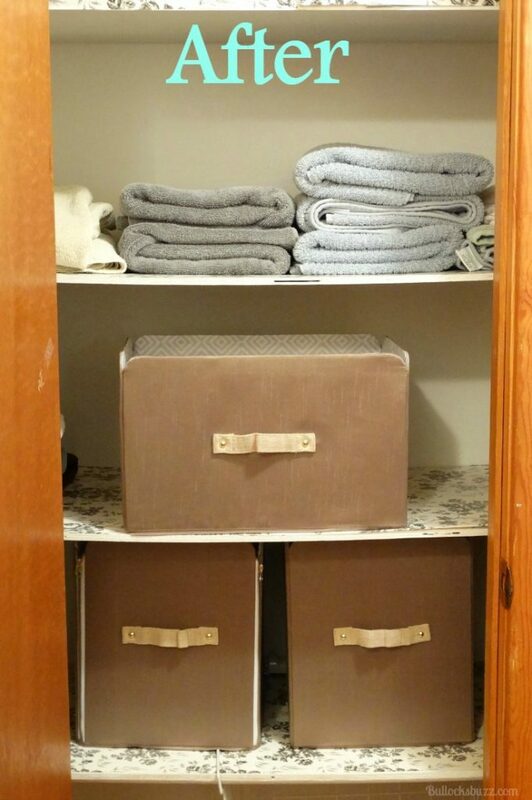 The second closet I wanted to organize was the linen closet outside the bathroom in the hallway. 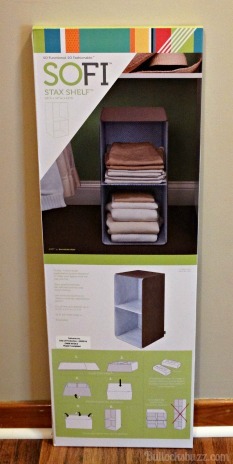 With five shelves, it is where we keep our towels, wash cloths, linens and extra toiletries. 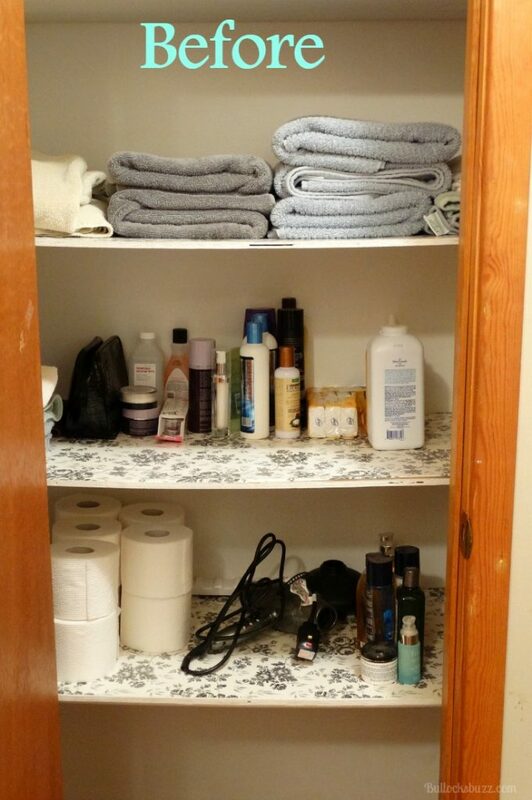 While the towels and linens fit nicely, the extra soaps, shampoos, and lotions, along with toilet paper, hair dryers and all the other bottles and containers placed on the shelves were not only unorganized, but a pain to sort through when looking for a particular item. 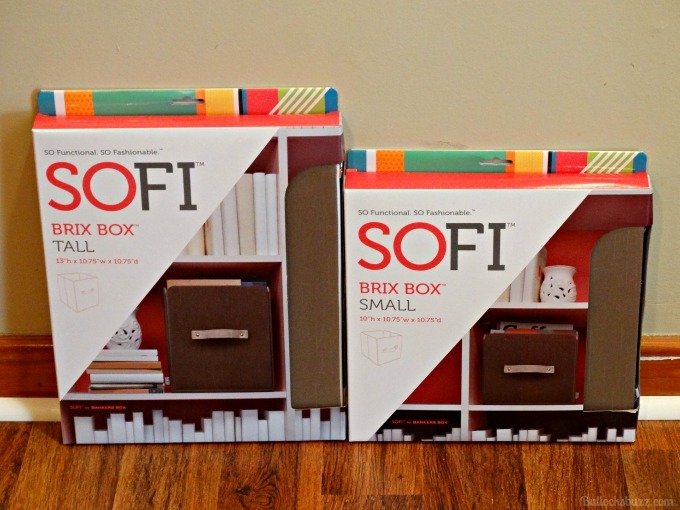 Now all of that fits perfectly inside the SOFI Zipper Totes and Brix Boxes. Each one holds specific items; for example, all of the shampoos, conditioners and lotions are in one, the extra rolls of toilet paper in another, and so on. It is much easier to find what I need, and the closet looks neat and clean! Monica Friel, organizing expert and president of Chaos to Order, offers these six tips for organizing your closet space into your own chic boutique for fashion. Before you begin to organize, make sure you have cleverly designed products to make your closet inspiring, vibrant and fun! 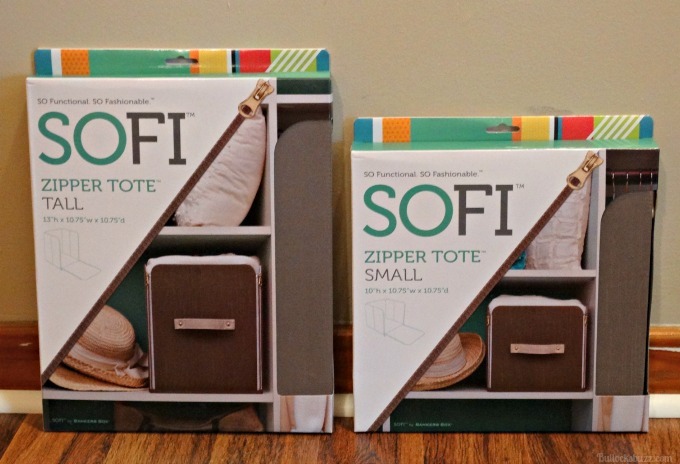 SOFI™ home organizational products can help you makeover your closet and make it look great! SOFI products’ gold fasteners and zipper accents, geometric print interiors, and sophisticated color palette bring you inspiration every time you open your closet door. Go through your closet item by item. Eliminate what you no longer like while gathering ideas for pieces you can add to update your existing clothing collection. The best way to know exactly what you have is to put like-items together. Try organizing by type of clothing or style and then by color. Keep the clothes you are currently wearing accessible so that you don’t waste time searching for the things you need. Take time to get out-of-season clothes stored away. This will make your closet feel less cramped, and help you what you own before hitting the stores. Organization is an ongoing process that requires efficient systems, maintenance and the good old-fashioned discipline of putting things back in place. With Monica Friel’s tips, you’ll be on your way to having your own couture closet space! 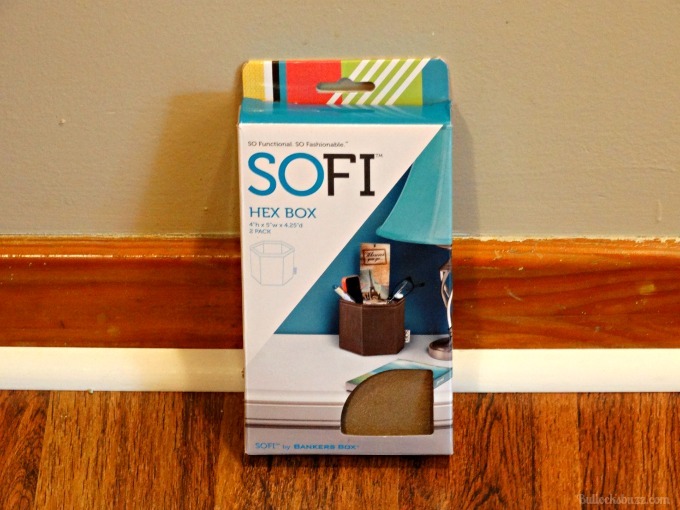 SOFI products can be found online and off at your favorite big box stores and on Amazon.com with retail prices ranging from $9.99 to $29.99. You can find a store near you by visiting their website and clicking on the purchase link for one of the products. That will open up a search box so you can find a retailer. 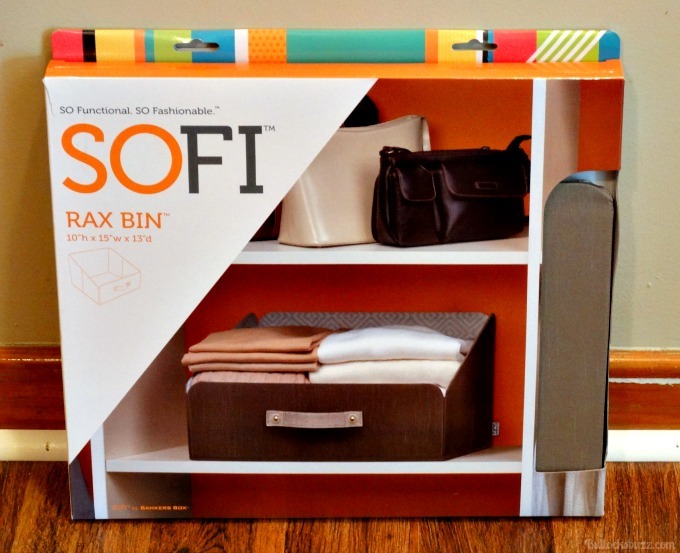 Thanks to SOFI, there is no need to sacrifice style or function when organizing your closet and home. Southern Fried Pork Chops – A Recipe The Whole Family Will Love! Copyright ©2019, Bullock's Buzz. All Rights Reserved.